Current Setup: Left side entry garage, home set back from street ~80 feet. Width of ~110ft. There is only 25ft from the garage to a retaining wall. There is limited area for guest parking, with no turn around space. If someone is parked in front of the garage, it is difficult to pull in (and I have already scratched the side of my car. I am deciding between a parking pad, which seems difficult to integrate and look nice versus a semicircle driveway. 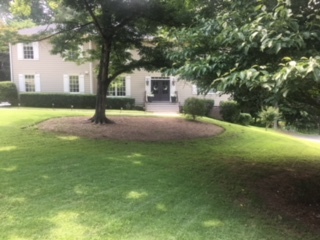 The semicircle driveway would have to be either off center of the house or require removing all of the existing trees in the front yard. 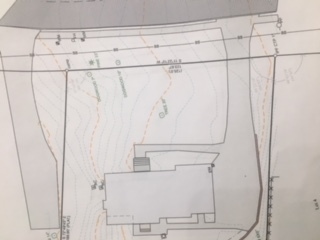 Included is a picture of the land survey including the trees and existing driveway. The water main and fire hydrant is at the top right hand corner. Thanks again! Shaped or circle driveway is a good solution for you. The trees add a lot of beauty to the front of the house. The slope to the side would make make a driveway look lopsided. I am emailing you a sketch I did on your property plan. The sketch is of a 2-car parking area off the driveway with a new sidewalk to the parking area. The sidewalk is important because it ties the parking to the front door. Planting would finish it off.